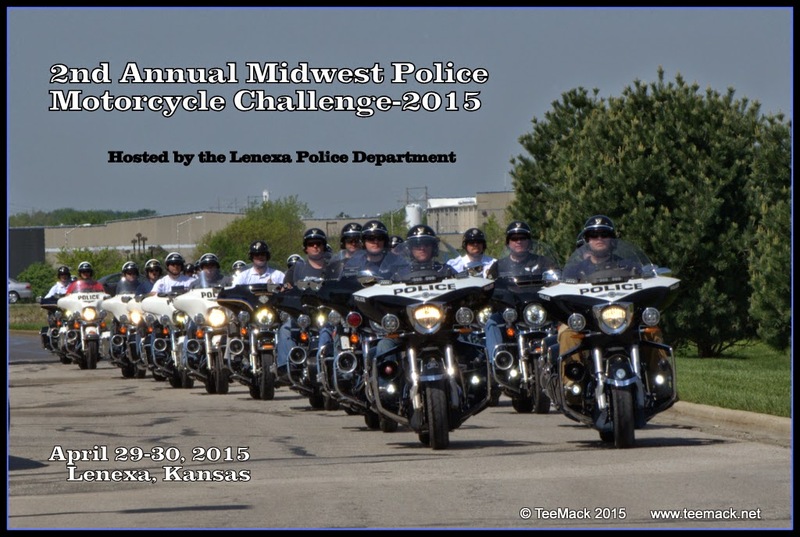 The Midwest Police Motorcycle Challenge was hosted by the Lenexa, Kansas Police Department on April 29-30, 2015. Over 40 Motorcycle Police Officers from Kansas, Missouri, Nebraska and Oklahoma attended the event. There were 9 timed obstacle courses that the officers were allowed to practiced on and one obstacle course that they could only walk through before riding the course. All courses were timed events. There were three team challenge courses. One team event was with two riders riding tandem hooked together with a magnet chain. The other team event had 4 riders follow each other through a obstacle course. There was also a slow ride 4 rider relay event. The event was sponsored by Digital-Ally, DSS Inc., Firearm Engraving, and Sombrero's Mexican Cantina. It was ideal weather for the event with temperatures in the 70's.
. Click here to view photos of the event.